Did You Know God Answers Prayers? No, Seriously. This first part might be silly to you. See, for weeks, I’ve had this worship song on the tip of my tongue. The only problem is that I can’t remember…well…any of it. I remember that it has a part where the girls echo. I remember that it is kind of upbeat. That it might have the line, “I need you.” I remember learning it in Summerville and singing it around a bonfire. And for weeks, whenever I’ve been singing around the house or in the car, I’ve tried to remember that song. I have racked my brain, you guys. Well, last Thursday, I was driving the kids to Chattanooga to meet my mom, and I was singing some worship songs (the drive to Chattanooga will do that to you. It is gorgeous!). The kids were content with their i-devices, and I was up front, singing softly through my repertoire, when that song-I-don’t-know came back into my head. Again, I tried in vain to tease it out of my brain, to no avail. Finally, I decided to pray about it. What made me want to pray was that the kids and I had recently read a biography of George Muller, the guy who started all the orphanages in Bristol in the 1800’s. That guy prayed for everything. It was nuts. He never asked for a dime for his orphan houses. He just literally prayed every day that God would supply their needs, and…God did. Seriously. It was insane. The thing is, Muller just had such faith in prayer. Like, he prayed and expected God to answer. I mean, really answer. You know? So, although my request was a far cry from feeding the orphans, I decided to pray about this song, just to see. I tried my best to think like George Muller and to really have an eager expectation of God answering my prayer. So even though I felt more than a little sheepish, I laughed nervously and asked God, “Please, tell me what that song is. I really want to sing it to You!” Then I waited for a second. When nothing popped into my head, I sighed and started to sing another song. Midway through, I stopped. I paused. Yes! Yes, that’s how it went. That’s the silly part of the story. But it gets better. The next day, I went to a homeschool convention, which was so much fun. I went to lots of sessions and got various tips about the benefits of notebooking and the importance of including art in your curriculum. It was the last session of the day, however, that really rocked my world. The session was called, “The Logic of English,” and it was taught by Denise Eide, the author of a phonics curriculum by the same name. Her 60-minute session blew me away. She really explained the nature of the English language to the packed room, and her thesis is that even though English is a complex morpho-phonetic language, it is not inherently inconsistent. We only think that it is because we don’t understand the rules for it. Using enough specific examples to convince me, Denise argued that the knowledge of 74 phonograms and 30 spelling rules will explain 98% of the English language. Even more than that, she used statistics to highlight the reality that our nation is experiencing a literacy crisis. She showed how literacy greatly affects one’s path in life (and the likelihood, for example, that one will end up in prison or on welfare), and she issued a stirring call to the church to step up and stand in the gap. She claimed that it is the duty of the Christian not just to teach our own children in our little nest, but also to make the world a better place. Not surprisingly, this all set my hair on fire. I drove home that evening, mulling over the implications of her talk and trying to figure out some way to bring her program to the kids at Youth Encouragement Services, an after-school program that is closely linked to our church. Should Greg and I buy the curriculum for Y.E.S.? How much would it cost? Would Daniel, the Y.E.S. director, even be interested in using it? Would it work well in a group setting? I had so many questions! That night, I prayed about it. And the next morning, I prayed some more. My song prayer had really bolstered my faith, and so I prayed what I call a “for-real prayer.” As in, “For real, God, I am expecting an answer to this–today. I need You to make this clear to me.” After I prayed, I talked to Greg about my conundrum. See, we had some money set aside to do something else for God’s kingdom, and I was wondering if God wanted me to use it instead for this curriculum. 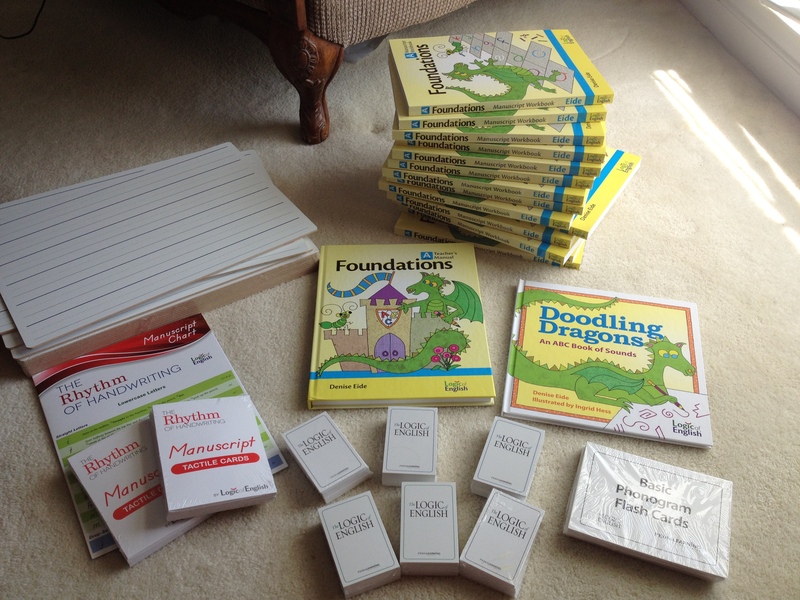 It wasn’t much, but enough to buy a teacher manual and some of the manipulatives. Maybe we could make our own workbooks? When I told Greg about it, he suggested, “Well, why don’t you ask her if she would cut a deal for Y.E.S. It’s a non-profit, after all.” Huh. I had never thought of that, but the more I considered it, the more sense it made. If Denise would work with us, then maybe we could use our money to do both things. That settled it. I asked God to let that be my sign that He wanted me to pursue The Logic of English. It seemed like a fair test: Denise had been so passionate about serving the community in her talk. We would see if she was in real life, as well. My resolve wavered several times before I got a chance to talk to her at her booth. Maybe that wasn’t such a good test after all. What if they weren’t willing to play ball–did that really mean that I shouldn’t use their curriculum at all? I lingered around the booth for awhile, and finally got a chance to talk to her husband about everything. He was open and supportive, and said they would be willing to work with us, but he wasn’t very committal on specifics, which honestly made sense to me. As I walked away, I pondered. Was that enough? Was that my sign? God knows that I need bright neon signs–We’ve been through this, time and time again, and He usually supplies the electric signs when I need them. Because of that, I just wasn’t sure that this was it. And that was my bright neon sign. This all came today, just one week after I prayed for a sign that God wanted us to use The Logic of English at Y.E.S. It is everything we need to launch a K-2nd grade class this summer, and we didn’t pay a dime for it. Denise donated it. She and I are also going to work on a grant proposal this summer for money to start a more extensive literacy program in the fall, one that includes more age groups. This past week has involved a lot of scrambling on the part of Daniel (the Y.E.S. director), Denise, and me, as we tried to figure out how to maximize this opportunity and start as soon as possible, without stretching our resources too far. Implementing a new program takes a lot of work, and I had to chuckle a couple of times as I thought, “Be careful what you pray for!” However, this is the type of work that is totally worth it, and it feels amazing to be doing something that seems so clearly in God’s direct will. I have no idea where this all will lead (right now, I’m focusing on doing “the next right thing”), but I am so thankful that I serve a God who does answer prayers, a God that lets us partner with Him to accomplish His purposes on this earth. Sometimes, I need to be reminded of that amazing reality, and I’m sharing this all with you, just in case you need to be reminded, too. Oh my gosh, Kim! This literally has me crying! How incredible and powerful and awe-inspiring! It kind of blew my mind, too, Drea. I needed to hear this one today. I’m feeling a little directionless and unsure of where to put my feet. Thanks for the reminder that I don’t need to figure it out myself. God and I are going to be spending some For Real time together today. Love you Kim. “For Real time”–love it! Let me know how it goes, friend! I will pray for you, as well; I know things are up in the air right now. Will call you later! Also, I don’t think your first example is silly at all. I think we need to be careful not to shrug off those “little” things. We might feel stupid telling them to someone else, but I know that in my own life God has used so many of those instances to strengthen my faith. The other day I was settling down in bed for the night, but there were bugs bothering me. By that I mean that while I was sitting up reading, a moth kept flying AT me, right at my head, and it was all over the pages of my book (which, if I remember right, was the Bible) so that I could barely even read it. Then, once I turned out the light and put my head on the pillow to sleep, I kept hearing a loud buzzing close to my ear, which was probably from a mosquito. Even with the covers pulled over my head I could tell it was there. Needless to say, I was very frustrated. In a moment of desperation, I prayed for God to make the bugs go away and stop bothering me so I could sleep. What proceeded that was a little conversation in my head about whether or not I really believed that He could/would actually do it. I assured myself that, yes, I really DO believe that He can and does do stuff like that. He has, after all, done things like this for me before. (I could tell you stories about bees and lizards if I haven’t already.) However, then a voice popped into my head (no, I didn’t actually hear anything, but it felt like it was coming from someone other than me) and said, “Then why do you still have the covers over your head?” Crap. The voice was right. Finally, I was able to drum up enough faith to expose my head and trust that God would respond accordingly. After that, I don’t know what happened to the bugs, but apparently I fell asleep–and I don’t remember having heard any more buzzing that night. BTW, the Logic of English stuff sounds really interesting. I wonder if it would be of any use to Spanish-speaking people trying to learn English. Becky, I actually thought of you when I was writing about the first example! In my mind, you are the champion of “little prayers”:). Even though they are little in scope, I do agree with you that those direct answers can bolster our faith. I do struggle sometimes with why God would give such direct answers to such little prayers, when so many of my “big” prayers seem to go UNanswered. One thought I had was that God might use little prayers very purposefully. Maybe–and I’m just thinking out loud here–if you get a direct “little prayer” answer, it’s God’s way of prodding you to talk to Him more or to ask for something bigger for His Kingdom. I don’t know. That just happened to be the case with me this time. As for The Logic of English, I think it would help with Spanish speakers. At the least, it clearly explains how English is very different, structurally from Spanish, and it seems to provide a clear, systematic approach to mastering the language. I know that adults use her “Essentials” program. Here is a youtube video that seems to be close to the presentation I heard at the conference: http://www.youtube.com/watch?v=4ilthoEG39M. I do wish that it would show her power point as well. You should check it out. I thought it was interesting, and it wasn’t just me. The room was packed, and the audience was riveted the whole time. PS. The powerpoint is included as she continues. Back to the prayer thing, I’m glad that my “little prayers” could be helpful to you. 🙂 I think you’re probably right that they help bolster our faith to the point where we feel like we can ask for bigger things. However, I think that there is value in those experiences in and of themselves as well. If you think of a relationship with a person, let’s say Greg for example, how would your relationship be if he only did the big things but neglected the small things? Often, I think we expect the big things (working to make money for the family, etc. ), but it’s the little things that actually make the relationship (random kisses–or whatever). For me it’s the same in my relationship with God. The little things are the things that make me really love Him. Sure, it’s easier to say that certain things are just coincidences (getting the closest parking space, etc. ), but for that reason I think it takes even more faith to believe that God IS in control of the little things. The big things are just more obvious. As to why we feel that God doesn’t always answer the “big prayers”–at least not on our timetable or in the ways we would want–well, there could be many answers to that. But, maybe He needs us to focus more on the small things to get somewhere with the big things. For example, we might pray for God to eliminate world hunger. That is a really huge, daunting thing that seems most of the time that it can never happen. But, if we take it down a few notches and pray for God to bring us in contact with an individual person who we can help, things start to happen. My struggle with prayer (since we’re talking… Hi, Kim! LOL) is that, since I DO know that it “works,” I feel a greater responsibility to do it. Actually, lately I have really been trying to focus more on prayer, and God has definitely been answering. BUT, when I DON’T pray, I feel like bad things happen. I end up feeling guilty because I let the person down for whom I was supposed to be praying. Obviously, I am just an imperfect human who will never be able to keep up with the whole prayer thing perfectly. I know that it is God who is actually doing the “work.” I am just acting as a facilitator (sort of). Still, it does seem to me that, if saying prayers actually leads to good things happening, the converse is also true. I don’t think that God is so cold as to say, “Oh well… You didn’t pray so I’m going to give this person a curse instead of a blessing today.” Still, I feel burdened (negatively) by the responsibility to pray, and I’m not sure what my response should be. I just wanted to say that what you are doing thru YES is exactly what I had been thinking about doing in our area. Last year a lot of funding was cut in the local schools and some of the first programs eliminated were after school programs that helped kids with their homework, and tutoring programs. I would love to hear more about how you started the YES program, if you have time! What an awesome way to minister to kids! Kim, Thank you for the reminder of the power of prayer. You and Denise are a demonstration of passion with action. Kim, it’s amazing how God works things out. Your prayers make me think of Paul’s letter to the Thessalonians where he tells them to pray continuously. It’s an attitude of constant unceasing reliance on God, expressing that to him and knowing that he wants us in communication wiht him all the time, that opens us up to recognizing just how much he does for us and wants to take care of us. Thanks for helping me think through this today, Kim. P.P.S. So glad to see you writing again!